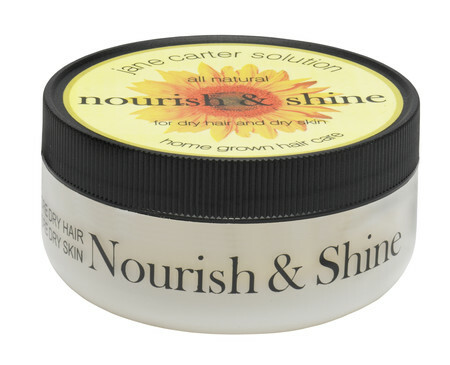 Jane Carter Solution’s Nourish & Shine is a blend of all natural, healthy butters with vitamins and essential oils to nourish hair and replenish dry, parched strands as well as moisturize your face and body! Ideal for medium to coarse hair textures, the creamy butters melt into strands like a dream, reducing dry, coarse hair without weighing hair down or leaving hair feeling or looking greasy. The Shea butter based moisturizer is also infused with mango butter and citruses such as lemon, orange and grapefruit to add a rejuvenating scent. Nourish & Shine is 100% natural and great for your skin too! You can use it on your face as an all over moisturizer, on dry patchy areas or as an overall moisturizer. When applied to my face, it gives my skin a fresh, dewy glow! This creamy moisturizer is great for sealing in moisture and adding shine. For hair, start with a pea sized amount, rubbing your palms together, the Nourish & Shine will start to dissolve and then apply it directly to your hair, as a finisher. It's a thick, creamy based texture that turns to an oil on contact. For best results, seal in after misting with a water-based hydrator. A little goes a long way! For Skin, add generously, anywhere you'd like. It can be used on dry hands, feet, lips, etc. I use it all over as a moisturizer a few times a week, especially on my lips! This product can work for the entire family but a little goes a long way. Nourish & Shine retails for $22 and can be picked up at your local Target, ULTA, Sally Beauty Supply, select Whole Foods and at www.janecartersolution.com.